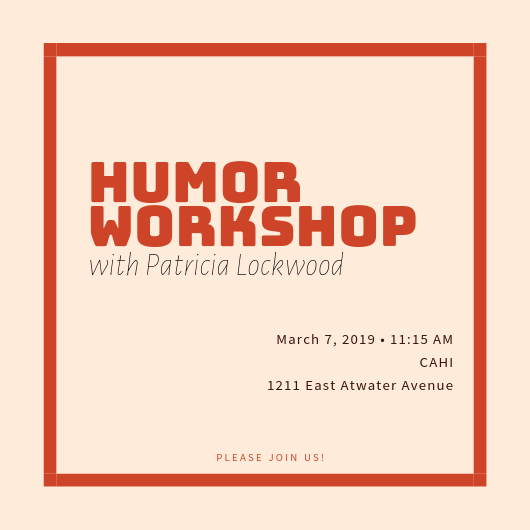 Reaching out to invite everyone to the humor workshop with Patricia Lockwood next Thursday, March 7 at 11:15 a.m at CAHI (1211 East Atwater Avenue). I'm sure most of you have heard about her reading Wednesday night as this year's Susan D. Gubar Lecturer, so if you want to spend a little more time with her, please join us! She's going to share some of her influences and speak about how humor functions in her memoir Priestdaddy. She might also give some tips for us to bring to our own writing. We hope to see you there!